Scours can occur as a result of pathogens and stressors, leading to electrolyte loss and dehydration, and in some cases, death. 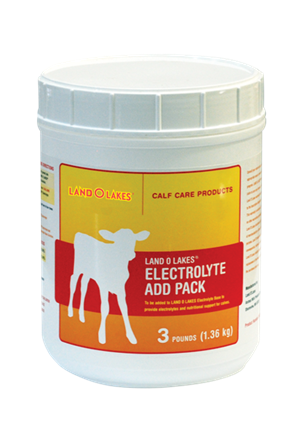 LAND O LAKES® Electrolyte System is designed to aid in early prevention of dehydration, scours, heat or cold stress and electrolyte loss in young calves. 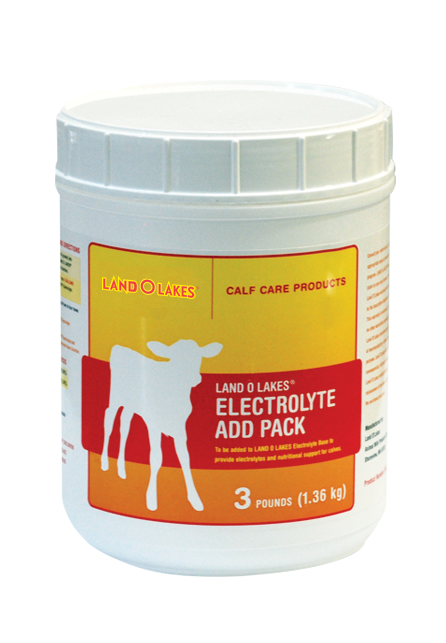 The LAND O LAKES® Electrolyte System is composed of two parts. The Base addresses the early preventative state, and the Add Pack, combined with the Base, executes the treatment stage. Composed of high dextrose for quick energy and Vitamin B Complex, the Electrolyte System Base provides beneficial electrolytes through its superior suspension technology. Base is a useful tool to use at the first signs of scours, before visible signs of dehydration. The product should also be fed before stressful events such as a long transport, introduction of new calves to the group, or hot and humid weather.